Stop back here for things I find that are fun, goofy, or ridiculous. 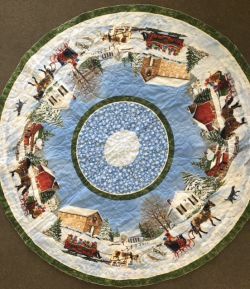 April 21, 2016: Is something wrong with Carol's tree skirt? Oops, forgot the hole. I really enjoy making dolls. When I was in 8th grade I started making stuffed dolls and animals along with clothes. All were made using commercially available patterns. I have taken a few classes with Charlie Patricolo. I was amazed that I could make dolls any way I wanted. It simply had never occurred to me to design my own dolls, or modify patterns or designs. I don't claim to be an expert; I just have fun making these. I coordinate the medical education doll activity at The Quilting Season. I developed a simple doll pattern for these dolls which is available in FREE STUFF. I love eating “real” bread, by which I mean homemade bread. I remember punching dough for my mother in a large bowl at our kitchen table. I received the Tassajara Bread Book for a wedding present, and started making bread for myself quite a lot in my 20s. I'm really interested in passing the torch to others. There is no comparison between store bought bread and what I make a home. I'll share my tips and tricks on making bread, including my basic way to make it. --Use Crisco for greasing your bread pans. The bread never sticks like it does with oil. A small can of Crisco lasts me several years. --Keep the mess in one container. I use a large bowl or a roasting pan (such as for roasting your turkey) and do all my mixing and kneading in the container. This keeps the mess down and makes clean up easier.